इंग्लैंड के नॉरफ्लॉक काउंटी के एगो अस्थान थेटफोर्ड में पैदा पेन सन् 1774 ई॰ में बेंजामिन फ्रैंकलिन के मदद से अमेरिका गइलें, अमेरिकी क्रांति के सुरु होखे से ठीक पहिले। उनुके लिखल पम्फलेट कॉमन सेंस (1776) के ओह समय लगभग हर क्रांतिकारी पढ़ले या एकरे पाठ के सुनले होखी। अनुपात के हिसाब से देखल जाय त उनुकर ई रचना दुनिया के सर्बदा के बेस्ट सेलर कहाई। उनुकर दुसरी पम्फलेट के सीरीज, द अमेरिकन क्राइसिस (1776-83) भी एगो क्रांति समर्थक प्रकाशन रहे। कॉमन सेंस अतना परभावशाली रहे की जॉन एडम्स कहलें की, "कॉमन सेंस के लेखक के कलम के बिना वाशिंगटन के तलवार ब्यर्थ में उठल साबित भइल रहित।"
↑ 1.0 1.1 Conway, Moncure D. (1908). 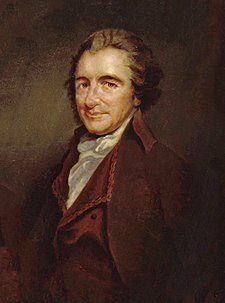 The Life of Thomas Paine. Vol. I. p. 3. Cobbett, William, Illustrator. G. P. Putnam's Sons. पहुँचतिथी 2013-10-02. – In the contemporary record as noted by Conway, Paine's birth date is printed in Volume I, page 3, as जनवरी 29, 1736–37. Common practice was to use a dash or a slash to separate the old-style year from the new-style year. Paine's birth date, between जनवरी 1, and मार्च 25, advances by eleven days and his year increases by one to फरवरी 9, 1737. The O.S. link gives more detail if needed. ↑ Contemporary records, which used the Julian calendar and the Annunciation Style of enumerating years, recorded his birth as जनवरी 29, 1736. The provisions of the British Calendar (New Style) Act 1750, implemented in 1752, altered the official British dating method to the Gregorian calendar with the start of the year on जनवरी 1 (it had been मार्च 25). These changes resulted in dates being moved forward 11 days, and for those between जनवरी 1 and मार्च 25, an advance of one year. For a further explanation, see: Old Style and New Style dates. ↑ Ayer, Alfred Jules (1990). Thomas Paine. University of Chicago Press. प. 1. ISBN 0-226-03339-2.